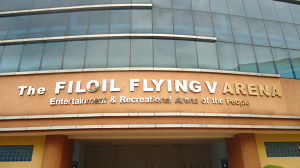 Formerly known as The Arena in San Juan, The Filoil Flying V Arena is an indoor sporting stadium with 5,000 capacity and is situated along west side of Santolan Road near corner P. Guevara Street in San Juan City, Metro Manila. It is under jurisdiction of Barangay Corazon De Jesus. There are important landmarks located near the arena that make commuting to the coliseum relatively easy. If you're coming from EDSA, the first important landmark you should watch for to the right of Santolan Road very close to the bowl is the Fountain International School. Once you see the school institution, get off the jeepney. Next to the school is San Juan Police Station. 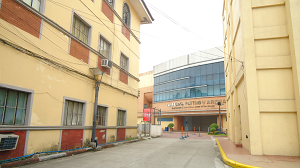 Between the school and police station is the access road that leads to Filoil Flying V Arena. See Map below this article. If you're coming from Quiapo, Morayta, Legarda, LRT-2 V. Mapa Station, Magsaysay Boulevard, Araneta Avenue and SM City Sta Mesa, watch for P. Guevara Street where Caltex and Seaoil gas stations are located on two corners to your right. There's also road sign that read P Guevarra St attached above the traffic light post at the corner of Santolan Road and P. Guevarra Street. Get off the bus or jeep at P. Guevarra Street. One important thing, if you're riding a jeep or bus from SM City Sta Mesa or Quiapo, please remember that Santolan Road is the extension of Pinaglabanan Street. That means Pinaglabanan Street changes its name to Santolan Road in P. Guevarra Street. See map below this article. Below are detailed commuting directions from different places in Metro Manila to the exact location of The FILOIL Flying V Arena. For your convenience, I created a link on each route to the part of this article that details how you can observe places along the ride as you get nearer. In this way, you are assured that you don't exceed to its location without you knowing it, even if it's your first time to head out to San Juan arena. This is important because there are bus conductors and jeepney drivers that forget to tell passengers that they've already arrived to their destination even though the passengers requested to drop them off at the location. In this guide, there's no need for you to depend on the driver and conductor to get to the exact location of this arena. Just follow the clear-cut direction. The links are placed at the end of each route. From SM North, Trinoma, West Avenue, Project 6 and nearby areas. Ride an MRT train bound for Taft. Get off the train at Santolan Station. Ride a bus along EDSA with "Ortigas Ilalim" on its sign in the front. Get off the bus at Ortigas Avenue. Along Ortigas Avenue near corner EDSA is the terminal of jeepneys with "ROSARIO - SAN JUAN" sign on both sides and "San Juan" sign in the front. Ride one of these jeepneys and pay minimum fare. If you don't see any jeep, just wait for one to arrive. Click HERE for complete guide. From Monumento, Malanday, Caloocan, Malabon, Navotas, Valenzuela, 5th Avenue and areas nearby. Ride a bus of any destination down south, e.g. Baclaran, Alabang, FTI, Sucat but must also diplays "Ortigas Ilalim" sign in front. Get off the bus at Ortigas Avenue and walk your way to the jeepney terminal along Ortigas Avenue near EDSA. Follow direction at Route #1. If you want to take an MRT train, then get off the bus at North Avenue Station and follow direction at Route #1. Click HERE for complete guide after reading Route #1. From Novaliches, Congressional, Project 7-8, Munoz, Roosevelt, UP Diliman, Fairview, Philcoa, UP Ayala Technopark, Quezon Memorial Circle, East Avenue, Central, Tandang Sora and nearby areas. Ride a bus of any destination south of Metro Manila but make sure it has "Ortigas Ilalim" sign in front as well. Get off the bus at Ortigas Avenue and go to the terminal of jeepney with "Rosario - San Juan" sign located along Ortigas Avenue near corner of EDSA. If you don't see any jeep, just wait for one to arrive. Alternatively, you can ride Taft bound train at MRT North Station. Follow direction in Route #1. Click HERE for complete guide. From Baclaran, Paranaque, NAIA Terminal 1 & 2, Coastal Mall, NAIA Road and nearby areas. Just ride a bus of any destination north of Metro Manila, e.g. "Fairview", "Monumento", "Malanday", "Novaliches" etc., but with "Ortigas Ilalim" sign in front as well. Get off the bus at Robinsons Galleria. Use the pedestrian overpass and go to the other side of Ortigas Avenue. Ride a jeepney with "San Juan" sign in front. Pay minimum and tell the driver either P. Guevarra or San Juan Arena. Click HERE for complete guide. Alternatively, if you want to get to the arena quickly, you can get off the bus at Taft, ride a North bound train, alight at Ortigas Station, ride another bus with "Ortigas Ilalim" on its sign and get off the bus at Robinson's Galleria which is located at Ortigas Avenue. From Alabang, Sucat, Bicutan, Festival Mall, Metropolis Star Mall, and other nearby areas. Just ride a bus bound for north of Metro Manila, e.g. "Monumento" and "Fairview" but must also displays "Ortigas Ilalim" sign in front. Follow direction at Route #4. After reading route #4, click HERE for complete guide. If traffic in EDSA is heavy, you can ride an MRT train at Magallanes Station and alight at Ortigas Station, then walk your way to Ortigas Avenue or take another bus if its too far for you. From SM Mall of Asia or MOA, Blue Wave Macapagal, Harrizon Plaza, Libertad Pasay now known as Arnaiz Avenue and nearby areas. Just ride a jeepney that passes by MRT Taft Station. In MOA, ride a jeep with "Malibay" sign. There's a multi cab turned jeepney bound for Pasay Taft but you need to walk far to get to MRT Taft so I recommend to ride the Malibay bound jeepney which is situated at the FX and jeepney terminal opposite SM MOA Department Store in South Parking building and near to the under construction SM Arena. From Harrizon Plaza, ride a jeep bound for Baclaran, alight at EDSA and ride a Malibay bound jeepney. From Arnaiz aka Libertad just ride a Malibay bound jeepney if your near corner Harrizon Street and Libertad, i.e. you're in Cuneta Astrodome. If you're near Taft corner Arnaiz aka Libertad, either ride a jeep bound for Baclaran/Pasay Rotunda or take a Baclaran bound train at LRT Libertad Station. Alight at MRT Taft Station, situated at EDSA-Taft Avenue intersection also known as Pasay Rotunda. Ride an MRT train bound for North Station, get off the train at Ortigas Station, walk to Ortigas Avenue or ride a bus with "Ortigas Ilalim" sign in front and alight at Robinson's Galleria. Use the pedestrian overpass to get to the other side of Ortigas Avenue. Take a jeepney with "San Juan" sign in front, pay minimum and tell the driver you're alighting at P. Guevarra or San Juan Arena. Click HERE for complete guide. From Pasig Palengke, Pasig Boulevard, Pasig Cathedral and nearby areas. Ride a jeepney or FX with "Quiapo Ilalim Crossing" sign and alight at EDSA or Shangri-La Plaza. Take a bus with "Ortigas Ilalim" on its sign in front. Get off the bus at Robinson's Galleria. Use the pedestrian overpass to get to the other side of Ortigas Avenue and ride a jeepney with "San Juan" sign in front. Pay munumum. 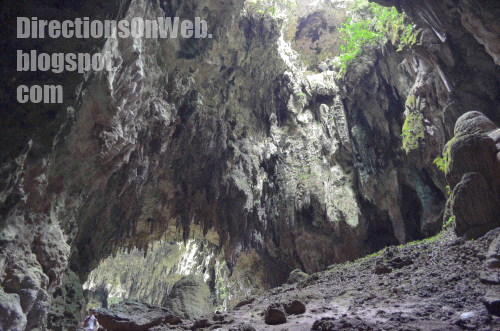 Your destination - P. Guevarra or San Juan Arena. Click HERE for complete guide. From Bonifacio Global City or BGC aka Fort Bonifacio, Market Market and nearby areas. Ride a bus or jeepney bound for Ayala-EDSA or a jeepney bound for Guadalupe. You can ride a train bound for North Station at either MRT Ayala Station or Guadalupe Station, alight at Ortigas Station, then walk to Ortigas Avenue or ride a bus with "Ortigas Ilalim" sign and get off the bus at Robinson's Galleria. Use the pedetrian overpass to get to the other side of Ortigas Avenue, and ride a jeepney with "San Juan" sign in front. Pay minumum fare. Click HERE for complete guide. From Ayala Avenue, Glorietta 1-2-3-4-5, Greenbelt 1-2-3-4-5, Paseo Center and other places in Makati CBD. Just take a walk to MRT Ayala Station or if you're way too in Ayala Avenue, ride a jeepney with "Ayala EDSA-MRT" sign. Take a train bound for NOrth Station at MRT Ayala Station and alight at Ortigas Station. Walk or ride a bus with "Ortigas Ilalim" sign in front and get off the bus at Robinson's Galleria. Use pedestrian overpass to get to the other side of Ortigas Avenue. Ride a jeepney with "San Juan" sign in front, pay minimum fare and tell the driver your destination as P. Guevarra or San Juan Arena. Click HERE for complete guide. From Robinson's Place Manila, SM City Manila, Mabini, M.H. Del Pilar, UN Avenue, and other places in Malate-Ermita Area. Head out to Quiapo. Ride a jeepney with "Quiapo" sign in Mabini, Taft Avenue or in P. Burgos - the road near to SM City Manila and Manila City Hall where public jeepneys pass through. Pay minimum fare and get off the jeep at Quiapo unloading area. Ride an RRCG or G-Liner bus with either "Cainta" or "Taytay" sign in front. These buses pick up passengers along Quezon Boulevard in Quiapo near the only pedestrian overpass in the area. If you don't see any bus, just wait for one to arrive. Tell the conductor your destination as P. Guevarra, that's the most prominent drop off point. Click HERE for complete guide. From Lerma, Espana, Nicanor Reyes formerly Morayta, Recto Avenue, Legarda, FEU, UST, Manila Plaza and other places in University belt area. RRCG and G-Liner buses bound for Taytay and Cainta pass through Lerma and Nicanor Reyes Street formerly known as Morayta to pick up passengers. It's just a walking distance from UST and just outside FEU. The bus also passes by Legarda. Ride one of these buses and alight at P. Guevarra Street. Click HERE for complete guide. From Binondo, Divisoria, Chinatown aka Ongpin, 999 Mall, Tutuban Mall, Isettan Recto, Avenida, Doroteo Jose LRT, Recto Station LRT, and other areas nearby. This route is via LRT-2 train. Ride an LRT-2 train in Recto Station bound for Santolan. If you're in Divisoria area, ride a jeep bound for Nicanor Reyes also known as Morayta or jeepney bound for Cubao or Quiapo. From Doroteo Jose LRT Station, walk inside the footbridge that connects it to Recto Station. Ongpin and Avenida is walking distance from Recto Station which is just outside Isettan Recto. Get off the train at V. Mapa Station, then ride an RRCG or G-Liner bus along Magsaysay Boulevard, the road where LRT V. Mapa Station is situated. You can ride just beneath the station or walk your way to Araneta Avenue, the road that intersects Magsaysay Boulevard and bordered SM City Sta Mesa, and ride right there at the designated loading and unloading zones. Get off the bus at P. Guevarra Street. Click HERE for complete guide. From LRT-2 Santolan Station, Sta Lucia East, SM City Marikina, Robinson's Metro East and places nearby. Ride a train bound for Recto at LRT-2 Santolan Station. Get off the train at V. Mapa Station, then ride an RRCG or G-Liner bus along Magsaysay Boulevard, the road where LRT V. Mapa Station is situated. You can ride just beneath the station or walk your way to Araneta Avenue, the road that intersects Magsaysay Boulevard and bordered SM City Sta Mesa, and ride right there at the designated loading and unloading zones. Get off the bus at P. Guevarra Street. Click HERE for complete guide. From provinces of Cavite, Batangas, Laguna and Quezon. If you're from Cavite, just take a bus or jeepney bound for Baclaran and follow direction at route #4. If you're from Batangas, Laguna and Quezon, take a bus bound for Manila and make sure you alight at the unloading zone near Magallanes. Walk your way to MRT-3 Magallanes Station, ride a train bound for North Station and get off the train at Ortigas Station. You can walk to Ortigas Avenue but it's a little bit far so you might just as well ride a bus with "Ortigas Ilalim" on its sign in the front and alight at Robinson's Galleria. Use the pedestrian overpass to get to the other side of Ortigas Avenue and ride a jeepney with "San Juan" sign in its front. Pay minimum. Click HERE for complete guide. How do you notice that you're already in the location of The Filoil Flying V Arena if you're riding a jeep from EDSA? The jeepney will traverse the whole stretch of Ortigas Avenue from EDSA. A lot of passengers will alight at Greenhills Shopping Center, which is located along Ortigas Avenue approximately 1.2 km from EDSA. There are a few intersections with traffic lights along Ortigas, but don't mind them. You can tell that you're nearing San Juan Arena once the jeep turn left from Ortigas Avenue to a little bit busy street called Santolan Road. It's only once that the jeep turns to another road. Ortigas then left on Santolan, that's it. In Santolan Road, watch for a street that runs diagonal from road to your right. After that, Santolan Road bends to the right in a slowly curving direction. At this point you're less than 300 meters to the access way of The Filoil Flying V Arena. 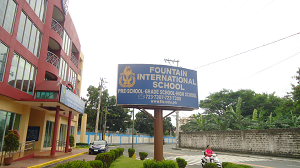 Watch for Fountain International School big sign to you're right. The school is located at the part of Santolan Road that bends back to the left in a little bit sharp curve. The signage of the school is massive so it's a perfect landmark. Get off the jeep right there. 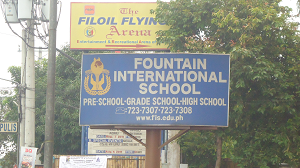 The Filoil Flying V Arena is visible from the access road next to Fountain International School. The access road is between the school and the San Juah Police Precint which located at the corner of Santolan and P. Guevarra Street. See map below. How do you notice you're already in the location of The Filoil Flying V Arena if you're riding a bus from Quiapo, Nicanor Reyes or Morayta, SM City Sta Mesa, V. Mapa Station, Araneta Avenue and N. Domingo? Okay, the important thing to remember is you'll be passing by SM City Sta Mesa. The bus turns right onto Araneta Avenue from the frontage of SM City Sta Mesa. Araneta Avenue ends in N. Domingo. The bus turns left on N. Domingo. In N. Domnigo, you will pass by a large Puregold branch to your right. Then the bus turns right onto the main road perpendicular to the right of N. Domingo. This road is Pinaglabanan, the road in which The Filoil Flying V Arena is situated to the left approximately 960 meters from the corner of N. Domingo. It just changes its name to Santolan Road in P. Guevarra Street. There are important institutions you should see before you reach P. Guevarra. A church called Holy Child Parish is to your right, followed by Pinaglabanan Elementary School, to the right as well. And then there's the monument built to commemorate 1896 Philippine Revouliton called Pinaglabanan Shrine located to the left of Pinaglabanan Street as the road bends to the left. 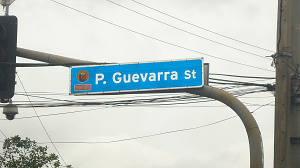 P. Guevarra Strret intersection is up ahead. Watch for Caltex to your right. Once you see it, you're also looking at P. Guevarra intersection, marked by traffic lights with "P. Guevarra" road sign attached to it. You can get off the bus if the traffic light is red. You can also alight at Seaoil Station. I don't recommend heading to Filoil Flying V Arena via P. Guevarra because it's more nearer and convenient via the access road between San Juan Police Station and Fountain International School. The police headquarters is located to the left of Santolan Road corner P. Guevarra Street. Next to it is the international school. Between them is the entryway to Filoil Flying V Arena which is just a few meters from the sidewalk. For visual guide, please see maps below. Jeepney route from EDSA to the location of Filoil Flying V Arena in San Juan. Red pins represent Fountain International School and San Juan Police Station, respectively. Bus route map from Quiapo, Morayta, V. Mapa, SM City Sta Mesa and N. Domingo to Filoil Flying V Arena in San Junan. Red pins represent San Juan Polic Station and Fountain International School. Thanks. Maraming Sports activities dito eh, like NCAA, Filoil pre-season basketball, Shakey's V League etc. Welcome, mukang hobby mo po manood ng mga live basketball games ha. Hindi naman. rumaraket lang pa minsan minsan. Sige sir. Ops meron pala akong gustong ishare syo na kung pwede po sana e madining ang opinyon mo kung di bawal sa Google mga method to increase pagerank na nakapaloob sa naopen ko na site bago ko sana gamitin. Mukang okay pero baka bawal. Email ko syo ang URL ng site, kung ok lang po. sige. try ko best ko ayon sa aking pagkakaintindi. Sir, email ko syo. Ano po uli email mo?